Definition at line 45 of file linked_lists.h. Definition at line 52 of file linked_lists.h. Definition at line 60 of file linked_lists.h. Definition at line 68 of file linked_lists.h. Definition at line 201 of file linked_lists.h. Definition at line 230 of file linked_lists.h. References LLLinkedList< DATA_TYPE >::checkData(), FALSE, llerror, LLLinkedList< DATA_TYPE >::LLLinkNode, LLLinkedList< DATA_TYPE >::mCount, LLLinkedList< DATA_TYPE >::mCurrentOperatingp, LLLinkedList< DATA_TYPE >::mCurrentp, LLLinkedList< DATA_TYPE >::mHead, LLLinkedList< DATA_TYPE >::LLLinkNode::mNextp, LLLinkedList< DATA_TYPE >::LLLinkNode::mPrevpp, and TRUE. Referenced by LLScriptAllocationManager::addAllocation(), LLLinkedList< DATA_TYPE >::addDataSorted(), LLToolView::addTool(), LLToolBrushLand::determineAffectedRegions(), LLFloaterPostcard::init(), LLDynamicTexture::LLDynamicTexture(), LLScriptEventData::LLScriptEventData(), LLVisualParamHint::LLVisualParamHint(), LLPolyMeshSharedData::loadMesh(), LLLinkedList< DATA_TYPE >::moveCurrentData(), LLLinkedList< DATA_TYPE >::moveData(), LLScriptEventData::set(), LLXferManager::startPendingDownloads(), and LLXferManager::updateHostStatus(). Definition at line 447 of file linked_lists.h. References LLLinkedList< DATA_TYPE >::checkData(), FALSE, llerror, LLLinkedList< DATA_TYPE >::LLLinkNode, LLLinkedList< DATA_TYPE >::mCount, LLLinkedList< DATA_TYPE >::mCurrentOperatingp, LLLinkedList< DATA_TYPE >::mCurrentp, LLLinkedList< DATA_TYPE >::mHead, LLLinkedList< DATA_TYPE >::LLLinkNode::mNextp, LLLinkedList< DATA_TYPE >::LLLinkNode::mPrevpp, NULL, and TRUE. Referenced by LLMaterialTable::add(), and LLScriptEventData::addEventData(). Definition at line 270 of file linked_lists.h. References llerror, LLLinkedList< DATA_TYPE >::LLLinkNode, LLLinkedList< DATA_TYPE >::mCount, LLLinkedList< DATA_TYPE >::mCurrentOperatingp, LLLinkedList< DATA_TYPE >::mCurrentp, LLLinkedList< DATA_TYPE >::mHead, LLLinkedList< DATA_TYPE >::LLLinkNode::mNextp, LLLinkedList< DATA_TYPE >::LLLinkNode::mPrevpp, and TRUE. Definition at line 303 of file linked_lists.h. References LLLinkedList< DATA_TYPE >::addData(), LLLinkedList< DATA_TYPE >::checkData(), FALSE, llerror, LLLinkedList< DATA_TYPE >::LLLinkNode, LLLinkedList< DATA_TYPE >::mCount, LLLinkedList< DATA_TYPE >::mCurrentOperatingp, LLLinkedList< DATA_TYPE >::mCurrentp, LLLinkedList< DATA_TYPE >::LLLinkNode::mDatap, LLLinkedList< DATA_TYPE >::mHead, LLLinkedList< DATA_TYPE >::mInsertBefore, LLLinkedList< DATA_TYPE >::LLLinkNode::mNextp, LLLinkedList< DATA_TYPE >::LLLinkNode::mPrevpp, NULL, and TRUE. Referenced by LLKeyframeMotionParam::addKeyframeMotion(), and LLControlGroup::saveToFile(). Definition at line 394 of file linked_lists.h. References count, FALSE, LLLinkedList< DATA_TYPE >::mCurrentOperatingp, LLLinkedList< DATA_TYPE >::mCurrentp, LLLinkedList< DATA_TYPE >::LLLinkNode::mDatap, LLLinkedList< DATA_TYPE >::mHead, LLLinkedList< DATA_TYPE >::mInsertBefore, LLLinkedList< DATA_TYPE >::LLLinkNode::mNextp, S32, and TRUE. Referenced by LLLinkedList< DATA_TYPE >::moveCurrentData(), and LLLinkedList< DATA_TYPE >::moveData(). Definition at line 686 of file linked_lists.h. References FALSE, LLLinkedList< DATA_TYPE >::mCurrentOperatingp, LLLinkedList< DATA_TYPE >::mCurrentp, LLLinkedList< DATA_TYPE >::LLLinkNode::mDatap, LLLinkedList< DATA_TYPE >::mHead, LLLinkedList< DATA_TYPE >::LLLinkNode::mNextp, and TRUE. Referenced by LLLinkedList< DATA_TYPE >::addData(), LLLinkedList< DATA_TYPE >::addDataAtEnd(), LLLinkedList< DATA_TYPE >::addDataSorted(), and LLToolBrushLand::determineAffectedRegions(). Definition at line 639 of file linked_lists.h. References LLLinkedList< DATA_TYPE >::LLLinkNode::deleteData(), LLLinkedList< DATA_TYPE >::mCount, LLLinkedList< DATA_TYPE >::mCurrentOperatingp, LLLinkedList< DATA_TYPE >::mCurrentp, LLLinkedList< DATA_TYPE >::mHead, LLLinkedList< DATA_TYPE >::LLLinkNode::mNextp, and NULL. Referenced by LLScriptAllocationManager::deleteAllocations(), LLXferManager::free(), LLScriptExecute::run(), LLXferManager::updateHostStatus(), LLMaterialTable::~LLMaterialTable(), LLPolyMeshSharedData::~LLPolyMeshSharedData(), LLScriptAllocationManager::~LLScriptAllocationManager(), LLScriptEventData::~LLScriptEventData(), and LLToolView::~LLToolView(). Definition at line 918 of file linked_lists.h. References LLLinkedList< DATA_TYPE >::LLLinkNode::deleteData(), llerror, LLLinkedList< DATA_TYPE >::mCount, LLLinkedList< DATA_TYPE >::mCurrentOperatingp, LLLinkedList< DATA_TYPE >::mCurrentp, LLLinkedList< DATA_TYPE >::LLLinkNode::mDatap, LLLinkedList< DATA_TYPE >::LLLinkNode::mNextp, and LLLinkedList< DATA_TYPE >::LLLinkNode::mPrevpp. Referenced by LLScriptEventData::removeEventType(), and LLScriptExecute::run(). Definition at line 584 of file linked_lists.h. References LLLinkedList< DATA_TYPE >::LLLinkNode::deleteData(), FALSE, llassert, llerror, LLLinkedList< DATA_TYPE >::mCount, LLLinkedList< DATA_TYPE >::mCurrentOperatingp, LLLinkedList< DATA_TYPE >::mCurrentp, LLLinkedList< DATA_TYPE >::LLLinkNode::mDatap, LLLinkedList< DATA_TYPE >::mHead, LLLinkedList< DATA_TYPE >::LLLinkNode::mNextp, LLLinkedList< DATA_TYPE >::LLLinkNode::mPrevpp, and TRUE. Definition at line 714 of file linked_lists.h. References LLLinkedList< DATA_TYPE >::mCurrentOperatingp, LLLinkedList< DATA_TYPE >::mCurrentp, LLLinkedList< DATA_TYPE >::LLLinkNode::mDatap, LLLinkedList< DATA_TYPE >::LLLinkNode::mNextp, and NULL. Definition at line 746 of file linked_lists.h. References LLLinkedList< DATA_TYPE >::mCurrentOperatingp, LLLinkedList< DATA_TYPE >::mCurrentp, LLLinkedList< DATA_TYPE >::LLLinkNode::mDatap, LLLinkedList< DATA_TYPE >::mHead, LLLinkedList< DATA_TYPE >::LLLinkNode::mNextp, and NULL. Referenced by LLMaterialTable::addDamageAndEnergy(), LLMaterialTable::addDensity(), LLMaterialTable::addFriction(), LLMaterialTable::addRestitution(), LLMaterialTable::addShatterSound(), LLXferManager::changeNumActiveXfers(), LLToolView::draw(), LLToolView::findToolContainer(), LLMaterialTable::getDamageMod(), LLMaterialTable::getDefaultTextureID(), LLMaterialTable::getDensity(), LLMaterialTable::getEPMod(), LLMaterialTable::getFriction(), LLMaterialTable::getHPMod(), LLMaterialTable::getMCode(), LLMaterialTable::getName(), LLScriptEventData::getNextEvent(), LLMaterialTable::getRestitution(), LLScriptEventData::getSavedSize(), LLMaterialTable::getShatterSoundUUID(), LLToolBrushLand::modifyLandAtPointGlobal(), LLToolBrushLand::modifyLandInSelectionGlobal(), LLXferManager::numActiveXfers(), LLXferManager::numPendingXfers(), LLXferManager::printHostStatus(), LLScriptEventData::removeEventType(), LLToolBrushLand::render(), LLVisualParamHint::requestHintUpdates(), LLScriptExecute::run(), LLControlGroup::saveToFile(), LLXferManager::startPendingDownloads(), LLToolBrushLand::undo(), LLXferManager::updateHostStatus(), and LLScriptEventData::write2bytestream(). Definition at line 790 of file linked_lists.h. Definition at line 500 of file linked_lists.h. Referenced by LLScriptEventData::addEventData(), LLControlGroup::saveToFile(), and LLScriptEventData::write2bytestream(). Definition at line 730 of file linked_lists.h. Referenced by LLMaterialTable::addDamageAndEnergy(), LLMaterialTable::addDensity(), LLMaterialTable::addFriction(), LLMaterialTable::addRestitution(), LLMaterialTable::addShatterSound(), LLXferManager::changeNumActiveXfers(), LLToolView::draw(), LLToolView::findToolContainer(), LLMaterialTable::getDamageMod(), LLMaterialTable::getDefaultTextureID(), LLMaterialTable::getDensity(), LLMaterialTable::getEPMod(), LLMaterialTable::getFriction(), LLMaterialTable::getHPMod(), LLMaterialTable::getMCode(), LLMaterialTable::getName(), LLScriptEventData::getNextEvent(), LLMaterialTable::getRestitution(), LLScriptEventData::getSavedSize(), LLMaterialTable::getShatterSoundUUID(), LLToolBrushLand::modifyLandAtPointGlobal(), LLToolBrushLand::modifyLandInSelectionGlobal(), LLXferManager::numActiveXfers(), LLXferManager::numPendingXfers(), LLPanelObject::postBuild(), LLXferManager::printHostStatus(), LLScriptEventData::removeEventType(), LLToolBrushLand::render(), LLVisualParamHint::requestHintUpdates(), LLScriptExecute::run(), LLControlGroup::saveToFile(), LLXferManager::startPendingDownloads(), LLToolBrushLand::undo(), LLDynamicTexture::updateAllInstances(), LLXferManager::updateHostStatus(), LLFloaterPostcard::updateUserInfo(), and LLScriptEventData::write2bytestream(). Definition at line 764 of file linked_lists.h. References i, LLLinkedList< DATA_TYPE >::mCurrentOperatingp, LLLinkedList< DATA_TYPE >::mHead, LLLinkedList< DATA_TYPE >::LLLinkNode::mNextp, and NULL. Definition at line 512 of file linked_lists.h. Definition at line 837 of file linked_lists.h. 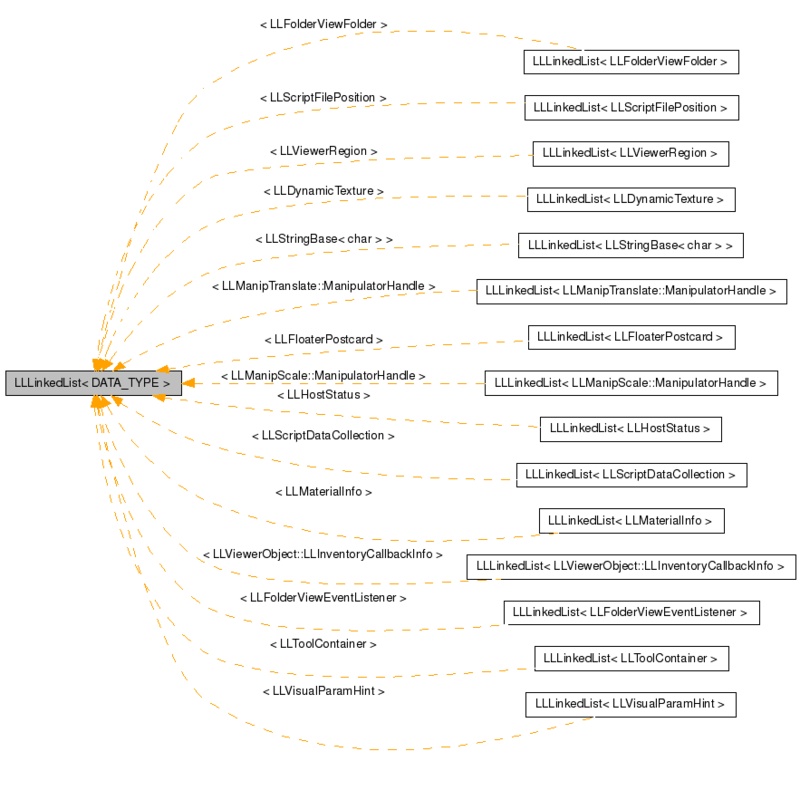 References LLLinkedList< DATA_TYPE >::addData(), LLLinkedList< DATA_TYPE >::bubbleSortList(), LLLinkedList< DATA_TYPE >::mCurrentOperatingp, LLLinkedList< DATA_TYPE >::mCurrentp, LLLinkedList< DATA_TYPE >::LLLinkNode::mNextp, and LLLinkedList< DATA_TYPE >::LLLinkNode::mPrevpp. Definition at line 860 of file linked_lists.h. References LLLinkedList< DATA_TYPE >::addData(), LLLinkedList< DATA_TYPE >::bubbleSortList(), FALSE, llerror, LLLinkedList< DATA_TYPE >::mCurrentOperatingp, LLLinkedList< DATA_TYPE >::mCurrentp, LLLinkedList< DATA_TYPE >::LLLinkNode::mDatap, LLLinkedList< DATA_TYPE >::mHead, LLLinkedList< DATA_TYPE >::LLLinkNode::mNextp, LLLinkedList< DATA_TYPE >::LLLinkNode::mPrevpp, and TRUE. Definition at line 662 of file linked_lists.h. References LLLinkedList< DATA_TYPE >::mCount, LLLinkedList< DATA_TYPE >::mCurrentOperatingp, LLLinkedList< DATA_TYPE >::mCurrentp, LLLinkedList< DATA_TYPE >::mHead, LLLinkedList< DATA_TYPE >::LLLinkNode::mNextp, NULL, and LLLinkedList< DATA_TYPE >::LLLinkNode::removeData(). Referenced by LLToolBrushLand::handleMouseUp(), LLToolBrushLand::modifyLandInSelectionGlobal(), and LLLinkedList< LLVisualParamHint >::~LLLinkedList(). Definition at line 811 of file linked_lists.h. References LLLinkedList< DATA_TYPE >::mCount, LLLinkedList< DATA_TYPE >::mCurrentOperatingp, LLLinkedList< DATA_TYPE >::mCurrentp, LLLinkedList< DATA_TYPE >::LLLinkNode::mNextp, LLLinkedList< DATA_TYPE >::LLLinkNode::mPrevpp, and LLLinkedList< DATA_TYPE >::LLLinkNode::removeData(). Definition at line 522 of file linked_lists.h. References FALSE, llerror, LLLinkedList< DATA_TYPE >::mCount, LLLinkedList< DATA_TYPE >::mCurrentOperatingp, LLLinkedList< DATA_TYPE >::mCurrentp, LLLinkedList< DATA_TYPE >::LLLinkNode::mDatap, LLLinkedList< DATA_TYPE >::mHead, LLLinkedList< DATA_TYPE >::LLLinkNode::mNextp, LLLinkedList< DATA_TYPE >::LLLinkNode::mPrevpp, LLLinkedList< DATA_TYPE >::LLLinkNode::removeData(), and TRUE. Referenced by LLFloaterPostcard::~LLFloaterPostcard(), and LLVisualParamHint::~LLVisualParamHint(). Definition at line 706 of file linked_lists.h. References LLLinkedList< DATA_TYPE >::mCurrentOperatingp, LLLinkedList< DATA_TYPE >::mCurrentp, LLLinkedList< DATA_TYPE >::mHead, and LLLinkedList< DATA_TYPE >::LLLinkNode::mNextp. Definition at line 74 of file linked_lists.h. Definition at line 48 of file linked_lists.h. Referenced by LLLinkedList< DATA_TYPE >::addData(), LLLinkedList< DATA_TYPE >::addDataAtEnd(), LLLinkedList< DATA_TYPE >::addDataNoCheck(), and LLLinkedList< DATA_TYPE >::addDataSorted(). Definition at line 226 of file linked_lists.h. Referenced by LLLinkedList< DATA_TYPE >::addData(), LLLinkedList< DATA_TYPE >::addDataAtEnd(), LLLinkedList< DATA_TYPE >::addDataNoCheck(), LLLinkedList< DATA_TYPE >::addDataSorted(), LLLinkedList< DATA_TYPE >::deleteAllData(), LLLinkedList< DATA_TYPE >::deleteCurrentData(), LLLinkedList< DATA_TYPE >::deleteData(), LLLinkedList< DATA_TYPE >::getLength(), LLLinkedList< DATA_TYPE >::isEmpty(), LLLinkedList< LLVisualParamHint >::LLLinkedList(), LLLinkedList< DATA_TYPE >::removeAllNodes(), LLLinkedList< DATA_TYPE >::removeCurrentData(), and LLLinkedList< DATA_TYPE >::removeData(). Definition at line 224 of file linked_lists.h. Referenced by LLLinkedList< DATA_TYPE >::addData(), LLLinkedList< DATA_TYPE >::addDataAtEnd(), LLLinkedList< DATA_TYPE >::addDataNoCheck(), LLLinkedList< DATA_TYPE >::addDataSorted(), LLLinkedList< DATA_TYPE >::bubbleSortList(), LLLinkedList< DATA_TYPE >::checkData(), LLLinkedList< DATA_TYPE >::deleteAllData(), LLLinkedList< DATA_TYPE >::deleteCurrentData(), LLLinkedList< DATA_TYPE >::deleteData(), LLLinkedList< DATA_TYPE >::getCurrentData(), LLLinkedList< DATA_TYPE >::getFirstData(), LLLinkedList< DATA_TYPE >::getLastData(), LLLinkedList< DATA_TYPE >::getNextData(), LLLinkedList< DATA_TYPE >::getNthData(), LLLinkedList< LLVisualParamHint >::LLLinkedList(), LLLinkedList< DATA_TYPE >::moveCurrentData(), LLLinkedList< DATA_TYPE >::moveData(), LLLinkedList< DATA_TYPE >::removeAllNodes(), LLLinkedList< DATA_TYPE >::removeCurrentData(), LLLinkedList< DATA_TYPE >::removeData(), and LLLinkedList< DATA_TYPE >::resetList(). Definition at line 223 of file linked_lists.h. Referenced by LLLinkedList< DATA_TYPE >::addData(), LLLinkedList< DATA_TYPE >::addDataAtEnd(), LLLinkedList< DATA_TYPE >::addDataNoCheck(), LLLinkedList< DATA_TYPE >::addDataSorted(), LLLinkedList< DATA_TYPE >::bubbleSortList(), LLLinkedList< DATA_TYPE >::checkData(), LLLinkedList< DATA_TYPE >::deleteAllData(), LLLinkedList< DATA_TYPE >::deleteCurrentData(), LLLinkedList< DATA_TYPE >::deleteData(), LLLinkedList< DATA_TYPE >::getCurrentData(), LLLinkedList< DATA_TYPE >::getFirstData(), LLLinkedList< DATA_TYPE >::getLastData(), LLLinkedList< DATA_TYPE >::getNextData(), LLLinkedList< LLVisualParamHint >::LLLinkedList(), LLLinkedList< DATA_TYPE >::moveCurrentData(), LLLinkedList< DATA_TYPE >::moveData(), LLLinkedList< DATA_TYPE >::removeAllNodes(), LLLinkedList< DATA_TYPE >::removeCurrentData(), LLLinkedList< DATA_TYPE >::removeData(), and LLLinkedList< DATA_TYPE >::resetList(). Definition at line 222 of file linked_lists.h. Referenced by LLLinkedList< DATA_TYPE >::addData(), LLLinkedList< LLVisualParamHint >::addData(), LLLinkedList< DATA_TYPE >::addDataAtEnd(), LLLinkedList< DATA_TYPE >::addDataNoCheck(), LLLinkedList< DATA_TYPE >::addDataSorted(), LLLinkedList< DATA_TYPE >::bubbleSortList(), LLLinkedList< DATA_TYPE >::checkData(), LLLinkedList< DATA_TYPE >::deleteAllData(), LLLinkedList< DATA_TYPE >::deleteData(), LLLinkedList< DATA_TYPE >::getFirstData(), LLLinkedList< DATA_TYPE >::getLastData(), LLLinkedList< DATA_TYPE >::getNthData(), LLLinkedList< LLVisualParamHint >::LLLinkedList(), LLLinkedList< DATA_TYPE >::moveData(), LLLinkedList< DATA_TYPE >::removeAllNodes(), LLLinkedList< DATA_TYPE >::removeData(), and LLLinkedList< DATA_TYPE >::resetList(). Referenced by LLLinkedList< DATA_TYPE >::addDataSorted(), LLLinkedList< DATA_TYPE >::bubbleSortList(), and LLLinkedList< LLVisualParamHint >::setInsertBefore().